I never thought I would say this, but I love Gibraltar! Not the tax-free shopping, mind you, nor the pubs, the casinos, nor the pesky monkeys. La Roca as the Spanish call sometimes it has a side that most visitors never see – kilometers of jungle-like trails with spectacular ocean views. Gibraltar is a small rocky outcrop (less than 7 km2) that has belonged to the British since 1704, in spite of numerous unsuccessful attempts by the Spanish to change this fact. 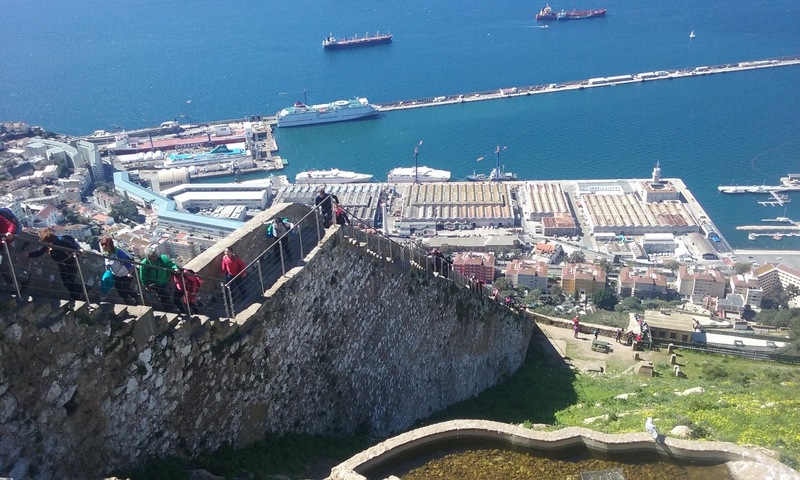 Today some 30.000 Gibraltarians populate the rock, practically living within sight of Africa. In the latest referendum in 2002, over 98% of the voting population wanted to remain British – and proudly so. The rock is beset with military monuments, as well as over 50 km of tunnels. However, most of the 12 million annual visitors (one of the highest visitor to local population ratio in the world) come there for the tax-free shopping, Marks and Spencer’s, the British Bobbies, English pubs or gambling in one of its 25+ casinos. Some visitors will venture with a taxi or a cable car to the top of the rock for the typical ‘monkey with African coast’ photo, but few will venture further. Yet, Gibraltar’s true beauty is its natural setting, the flora, fauna and its geological riches. Perched above the busy town centre, 420 m above the sea level, is one of Europe’s greatest natural reserves. We jumped on the chance to go to see this when RF Natura, a Ronda-based nature-excursion company, arranged a 14 km day-hike across the rock. It is not my intension to endorse companies, but when it comes to hiking in the mountain ranges and natural parks around here, one is best advised to go with an experienced guide, unless one wishes to become a vulture’s lunch. 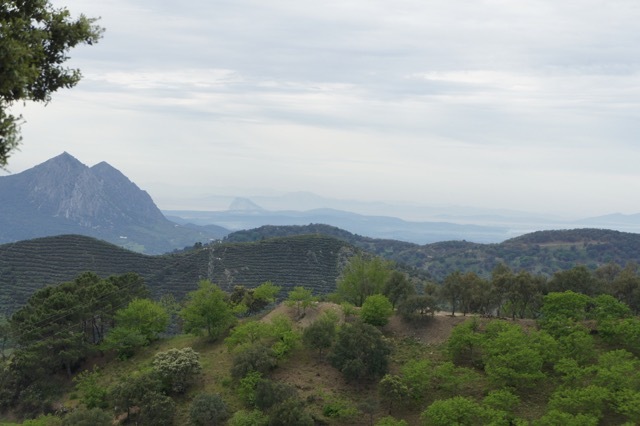 RF Natura’s founder, Rafael Flores, is an author and editor of several books about Andalucian nature. He knows every peak and valley from Southern Spain to the Atlas Mountains and will excitedly exclaim the Latin name of every rare flower as we trek along. With his trusted team of experienced co-guides, we could not imagine anybody better to lead our day-hike across the rock. Whether one drives the costal road from San Pedro, or overland from Ronda to Algeciras, at one point one will see this emblematic and stately rock, marking the end of Europe. El Peñon de Gibraltar is quite unique from a geological point of view, as it is the only monolithic limestone rock in the area. The surrounding costal mountains are primarily sandstone based. The formation of the limestone that today is known as Gibraltar began during the Jurassic Period with the accumulation of shells and marine organisms. As Gibraltar is located near the boundary between the Eurasian and African plates, the compression lifted the limestone layer above sea level. Today, curiously, only the isolated rock remains. To avoid border delays, we left the bus in the Spanish border town of La Linea, walking across the border checkpoint and the somewhat treacherous-looking runway of Gibraltar’s airport. Passing through Main street, with all stores closed and hardly a soul in site, we took off up a side street, which soon narrowed into one of the several flights of steps taking one up to the middle green belt, crossed by corkscrew roads, meandering their way up to Gibraltar’s upper rock. It was quite amazing to walk through a lush jungle-like forest on a peninsula that has no natural water reserves, rivers nor streams. Gibraltar’s water used to be provided by aqueducts, wells and captured rainwater, though today its supply of drinking water comes entirely from desalination from huge underground, or should I say under-rock reservoirs. Also scattered along the hike, was numerous bunkers, military barracks and other monuments, as testaments to the rock’s feisty past. 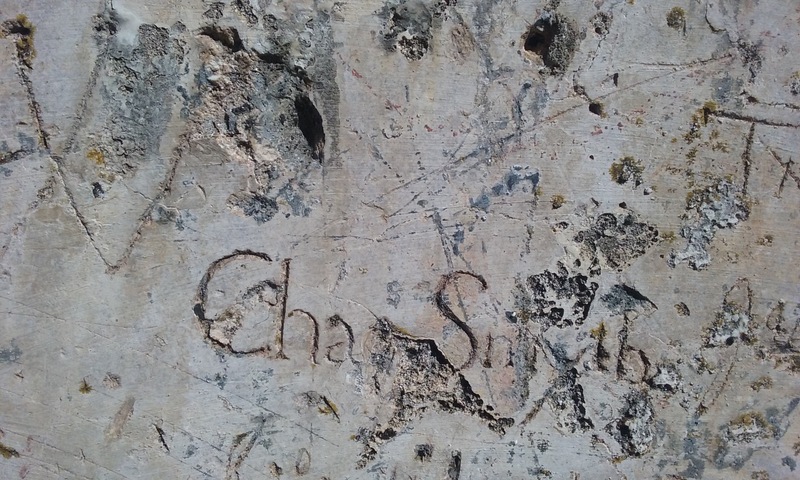 I am not one to ohh and ahh at a canon, but I did like the 250-year-old graffiti carved by soldiers, some with the nicest penmanship, into the crumbling limestone walls. The final ascent was a steep climb up the Queens Gate steps, several flights of stone stairs, part of it originally built as a wall by Philip II of Spain in the 16th century. 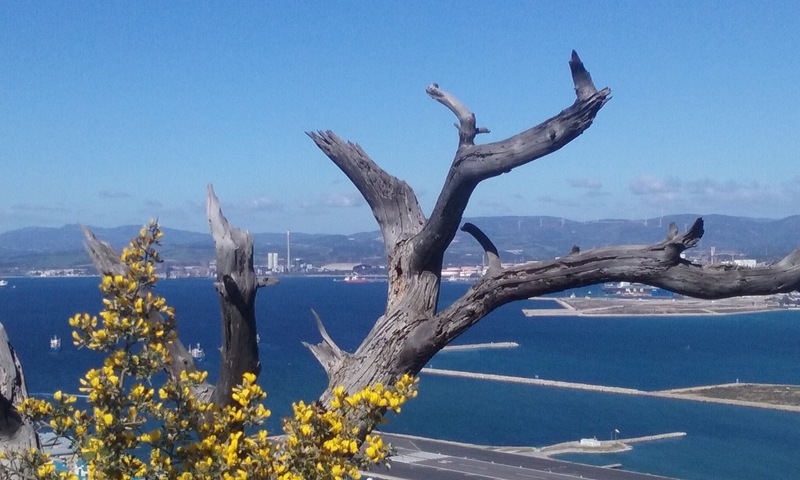 This is a great place to take a breather (or assure that a heart attack is not coming on, for those who rarely walk) and to enjoy a bird’s eye view of Gibraltar and further away in the sea mist, the busy harbour of Algeciras. Coming to the top at last, we stepped straight onto the road that bridge the two semi peaks of the Upper Rock Nature Reserve area. At some part of the day, this would be bumper to bumper minivan taxis, though when we got there, there were thankfully none. There was only a contingency of the islands most famous residents meeting us. Gibraltar’s Barbary macaques are allegedly the only wild population of monkeys in Europe. I say allegedly, as the monkeys sit plumped down like sloths on the roadway, barely moving out of the way for traffic, while waiting for a ‘benevolent’ tourist to throw them a scrap of food. Feeding the monkeys is highly illegal, as they now have their own feeding grounds. Watching the monkeys felt rather sad to me, and I could certainly understand that some of them have attacked the occasional tourist, as these flail away with their selfie sticks. I would too, if I was stranded up there with only delousing my fellow monkey mates as my past time. The top of the reserve still has some closed off military installations, though there are several stunning nature paths, some open to the public. 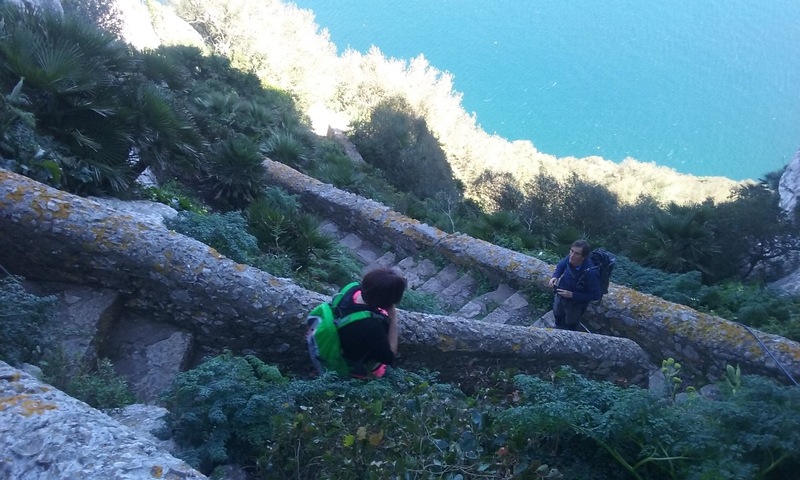 Our guide Antonio led us to the beginning of the famous Mediterranean Steps, located entirely within the Nature Reserve. 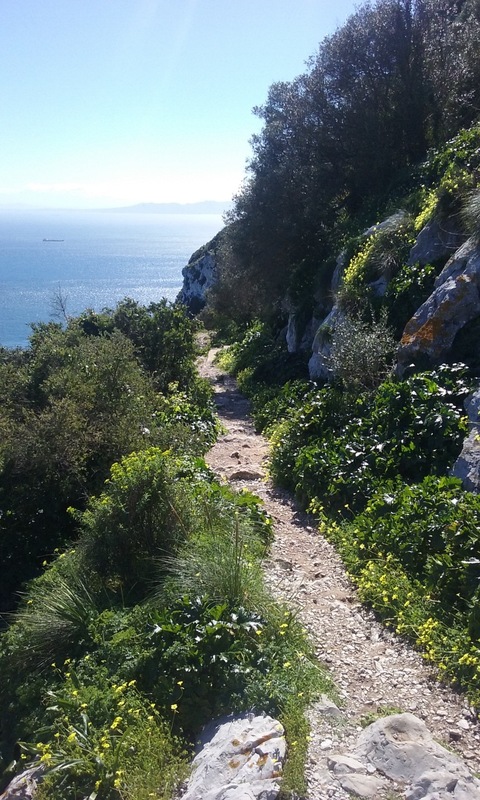 Originally built by the British military, is its now a pedestrian route from Gibraltar’s summit, descending through steps partly cut into the ground rock along the steep southern side of the rock, offering views of the Mediterranean and the coast of Africa. There are times when a picture can say a thousand words, and this is certainly one of those occasions. The blue cloudless sky, the silvery sea, the white limestone rock, the deep green tropical foliage with shocking yellow blooms throughout. I was completely in awe, drinking in the colours, hand over footing down the stairs, while clicking pictures like a Japanese tourist. I know it sounds banal, but I simply had to bring this feast for the eyes with me. 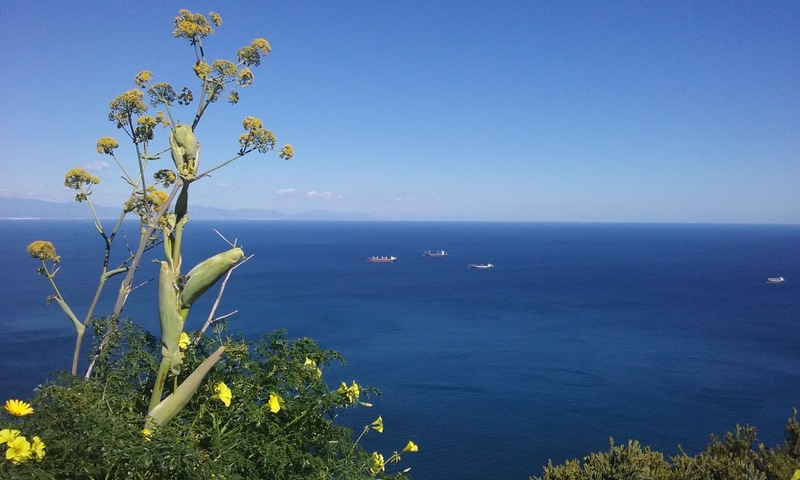 Gibraltar has more than 600 plant species, three of which are endemic and found nowhere else. In addition, there are species native to North Africa and Gibraltar is the only place in Europe where they are found. There are also wild white freesia, sweet-scented wild honeysuckle and sea lavender to name a few. The nature reserve is also home to about 300 species of birds, some permanently residing here, while others appear during their bi-annual migrating season. The rock of Gibraltar serves as a temporary stopover for many migrating species before continuing over waters or deserts en route to far-away places such as Russia or Greenland. Being of limestone, it is not surprising that Gibraltar also contains caves. The most famous, St. Michael’s Cave, has amazing stalactites and stalagmites, though the large concert venue and multi-coloured lighting gives it a somewhat theme park feel. However, Gorham’s Cave, located on the steep eastern face of the rock, is a hidden treasure. Archaeological excavations have found evidence that Neanderthals used it some 25,000 – 30,000 years ago, suggesting that this may be the place that our stoop-backed, heavy-fronted ancestors died out. The peninsula’s history and legends didn’t end there. The final stretch of our hike as we entered paved ground showed the place where one of the Pillars of Hercules has stood, guarding where the Mediterranean and the Atlantic Ocean meet. Clearly after such astonishing views, Gibraltar’s Main Street and a rather lame and costly coffee (in Gibraltar Pounds, of course) came as a bit of an anti-climax. 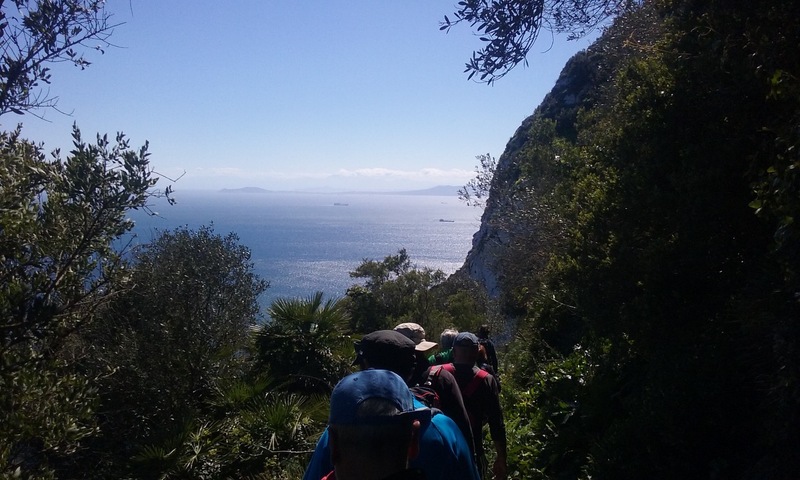 Yet, having done only a partial hike, our guide Antonio promised to bring us back another day to do the entire 31 km of paths on Gibraltar’s Upper Rock Nature Reserve. Any takers?